You can use forms for a wide range of scenarios - from a simple KYC (Know Your Customer) to receiving feedback from your customers at an event. 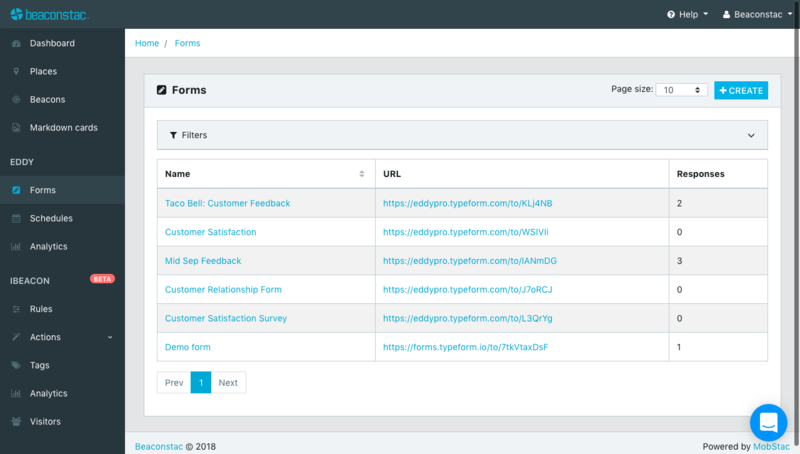 As you may have guessed, forms are simply customisable questionnaires that can help you gather responses from your customers. You can set these up under the Forms section on the Beaconstac dashboard. You are already provided with a couple of sample forms, typically, Customer Relationship Form and Customer Satisfaction Survey both of which can be used as is if needed. You can view the contents of these form by clicking on URL link next to the form. To create a new new form click on create at top right corner of the list. You will be required to provide a unique title and at least 1 field (questions) before you can create your form. You can choose the type of question from a variety of options we offer. You can also mark a question Required if you want it to be a compulsory question for the user submitting the form. After selecting the type you need to enter the question (preferably one liner) and a description elaborating the question (optional). Make sure to add answer options wherever necessary. Click on Add at the bottom to add this question to the form. Once done adding all questions, save the form by clicking on Create Form at the bottom of the page. You can see a live preview of the form by clicking on Preview on the subsequent page. Note that once the form is filled by a user the response gets recorded with us and is stored in your account. You can view all form responses by clicking on the form name in the list of forms.